Made by Zibiah Smallwood Hewson, American, 1749 - 1815. Center and possibly other textiles printed by John Hewson, American, 1745 - 1821. In 1790 the Society awarded Hewson a gold medal for the best example of calico printing in the state. Despite their contemporary popularity, the only documented Hewson textiles to survive are two large coverlets (one in the Philadelphia Museum of Art and the other in the Henry Francis du Pont Winterthur Museum), a number of squares, several of which were incorporated into the center of pieced-work quilts (including this example), and two handkerchiefs (both in the Historical Society of Pennsylvania, Philadelphia). Both of the coverlets are elaborately block-printed panels with swagged borders and center squares with a flower-filled urn flanked by butterflies and birds. The center squares were also produced separately in several variations and in at least two colorways for use in quilt tops, such as this bedcover made by Hewson's second wife. The subject and format of the center squares may have had their origins in Dutch flower-piece engravings from the late sixteenth and seventeenth centuries, such as those by Nicholaes de Bryn, Adrian Collaert, and Claes Jansz Visscher, as well as earlier German flower paintings by Ludger Tom Ring the Younger. Hewson's flower-filled urn is a neoclassical reinterpretation of an earlier form. The source of the smaller motifs may have been found in seventeenth-century Dutch pattern books and English engravings, which were similar to the needlework designs sold by the London print-sellers and publishers Peter Stent and John Overton. Their stock included a series of designs for birds on sprigs, parrots, and butterflies that could have been easily traced onto wood blocks for printing on fabric. The block-printed fabrics used in this Hewson bedcover are most likely English, although one, the blue-and-white resist pattern, may well be one of John Hewson's own "very neat gown patterns" in deep blue with white advertised in the Pennsylvania Packet on November 9, 1779. In any case, the small-patterned prints were originally dress fabrics dating from between 1790 and 1810. The trellis print on the side panels, however, is a furnishing fabric that would have been equally appropriate for slipcovers, draperies, or bed hangings. The framed center-square pattern is one of the earliest pieced-work formats, and was popular in both America and England during the late eighteenth and early nineteenth centuries. 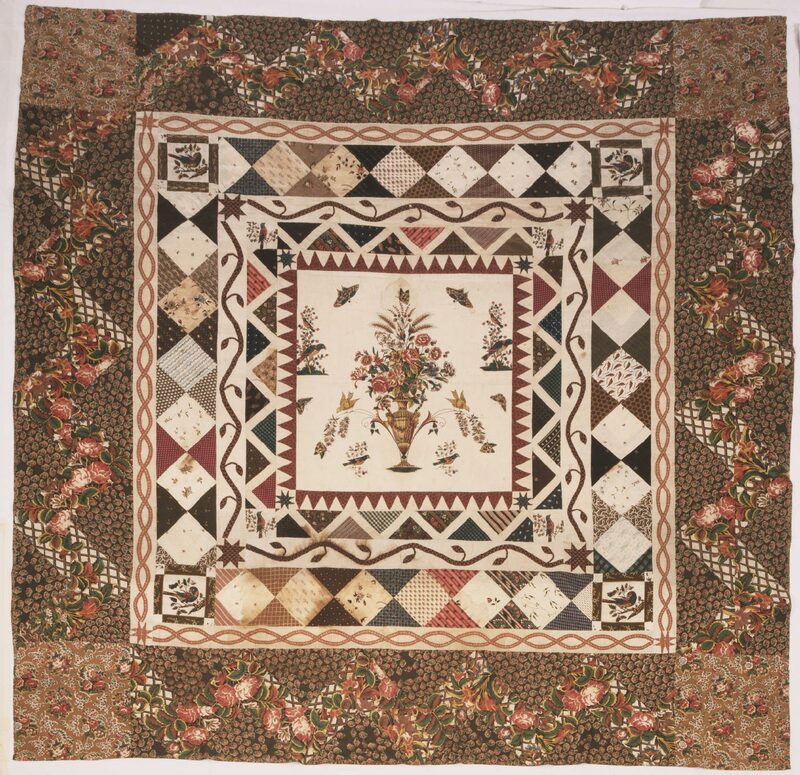 This Hewson example is similar in layout to others dating from about 1790 to 1800, such as the so-called Penn's Treaty pieced quilt made by Martha Washington (preserved at Mount Vernon, Virginia). Dilys Blum, from Nineteenth-Century Appliqué Quilts, Philadelphia Museum of Art Bulletin (1989), p. 10. 1. Pennsylvania Gazette, July 9, 1788. Zibiah Smallwood Hewson was the wife of the first American calico printer, John Hewson (see Philadelphia Museum of Art, 1930-100-1) who printed the center square of this bedcover. Dilys E. Blum, from The Fine Art of Textiles: The Collections of the Philadelphia Museum of Art (1997), p. 93.